Professor emeritus Bengt Hultqvist has passed away at the age of 91. Professor emeritus Bengt Hultqvist has been a very important person for space research in Sweden and in Kiruna, and not least for us at EISCAT. Bengt was called “the Hjalmar Lundbohm of space” because of his importance in Kiruna’s space activities equalling Hjalmar Lundbohm’s importance to Kiruna and the mining industry. As for EISCAT, Bengt was the initiator and to a large degree responsible for EISCAT Headquarters being located in Kiruna. The history of EISCAT started out with an idea that Bengt got in the 1960s. At that time incoherent scatter radar research was still a new concept, as the first measurements had been only recently obtained in 1958 by Ken Bowels and William Gordon. Bengt Hultqvist himself described the start of what later resulted in EISCAT like this: “… As time passed, I realized that there were no incoherent scatter radars in the auroral regions, nor were any plans for such known to me. That, of course, increased the desire to get one in the northern European part of the region, but the cost made it impossible to even think of finding money in Sweden for a Swedish one. In the middle of the 1960s I had been the official opponent when Olav Holt defended his doctoral thesis at the University of Oslo and we had learnt to know each other. A few years later he became the first professor of physics at the new University of Tromsø, two degrees of latitude north of Kiruna, at the center of the auroral zone. I phoned him and suggested that we should make an attempt to get an incoherent scatter facility as a joint project of the Nordic countries. In a meeting in Stockholm 17-18 September 1970, the decision to establish a European incoherent scatter radar in the auroral zone was taken. For this meeting Bengt invited research representatives from six countries: Finland, France, Germany, Great Britain, Norway and Sweden. The outcome from that meeting was that the earlier more preliminary expressions of interest by the European groups became more formal commitments. In 1973-1975 the structure of EISCAT took shape. Some of the most important decisions was to establishment a project group, to be headed by Tor Hagfors for the technical planning of the radar facility, and the establishment of the steering committee, appointed by Sir Granville Beynon. Bengt presented a report on the distribution of investment and running costs between Suomen Akatemia (SA), Finland, Norges Almenvitenskaplig Forskningsråd (NAVF), Norway, and Statens Naturvetenskapliga Forskningsråd (NFR), Sweden. Bengt also took part in a working group for formulating the bylaws. In 1974 Kiruna was decided to be the site of the EISCAT Headquarters. Many people came to be of great importance in the continued work of establishing EISCAT. Bengt writes about the first director of EISCAT, Tor Hagfors and how he suggested the name in his paper: “… Tor became the key figure in the planning work and the first director of the European Incoherent Scatter Facility (EISCAT). I believe Tor Hagfors did not participate in the Stockholm meeting, but I am certain that he attended the second planning meeting at Nançay as a member of the Norwegian group. In the following years the process of funding and building EISCAT continued. Contractors were signed for all three countries and negotiations with local research institutes where conducted both for personnel and drifting the facilities. The three research institutes became The Geophysical institute of Sodankylä in Finland, University of Tromsø in Norway and Kiruna Geophysical Institute in Sweden. As for all big building projects EISCAT was delayed. 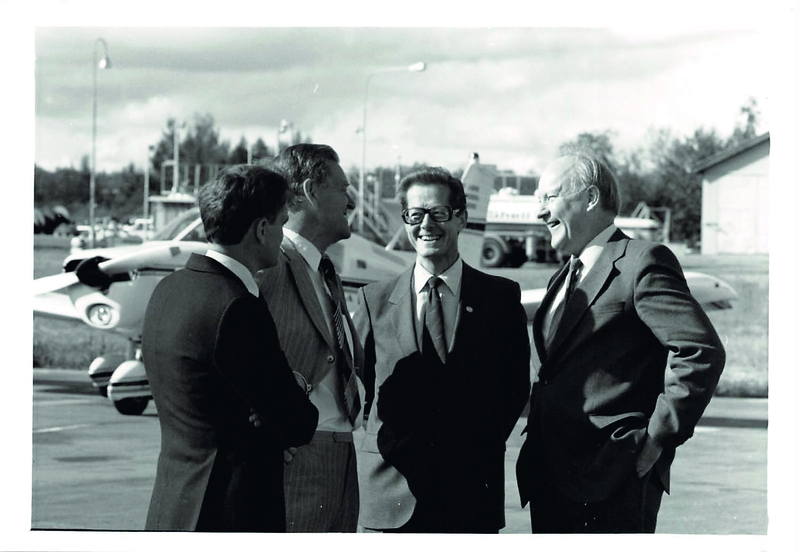 But on August 26th 1981 all three EISCAT sites were inaugurated by the King of Sweden, Carl XVI Gustaf. Bengt’s involvement in EISCAT continued throughout his life. Despite his retirement, Bengt did partake in a few of the meetings in the EISCAT3D project. Always interested and encouraging. Thanks to Bengt Hultqvist, EISCAT is and continues to be one of the pre-eminent incoherent scatter radars in the world. We cherish the memory of Bengt and all his efforts to make EISCAT possible. Bengt will be greatly missed. Hultqvist, B. (2011). History of EISCAT – Part 1: On the early history of EISCAT with special reference to the Swedish part of it. History of Geo- and Space Sciences. 2. 115-121. 10.5194/hgss-2-115-2011. Oksman, J. (2011). History of EISCAT – Part 2: The early history of EISCAT in Finland. History of Geo- and Space Sciences. 2. 123-128. 10.5194/hgss-2-123-2011. Holt, O. (2012). History of EISCAT – Part 3: The early history of EISCAT in Norway. History of Geo- and Space Sciences. 3. 47-52. 10.5194/hgss-3-47-2012. Haerendel, Gerhard. (2016). History of EISCAT – Part 4: On the German contribution to the early years of EISCAT. History of Geo- and Space Sciences. 7. 67-72. 10.5194/hgss-7-67-2016.